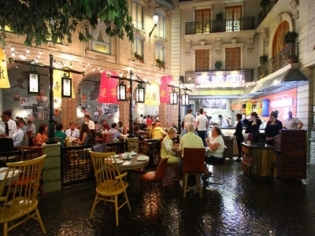 Yong Kang Street is meant to be reminiscent of the restaurant district in Taipei and its menu is distinctly different than traditional Chinese restaurants. Everything is made fresh, from dumplings to noodle soups, to fried rice, to dry noodle dishes and even the first ever dim sum carts on the Strip. There are over 20 varieties of dim sum and even a dessert menu! The décor is made to look as if you are dining on an outside patio with some tables inside a fenced area and others out on the “street.” Try the Taiwanese beef noodle, the pot stickers and the Barbeque combination platter.